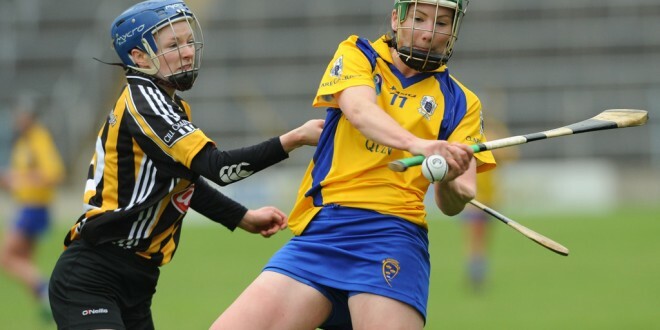 Fiona Lafferty helped Inagh-Kilnamona retain the Clare senior camogie title. Photograph by John Kelly. There were big wins for Clooney-Quin, Newmarket and Inagh-Kilnamona as the race for the Clare senior camogie title got underway this Friday evening. Holders Newmarket on Fergus made their intentions clear when they proved to strong for Kilkishen, winning on a scoreline of 2-17 to 1-6. They raced into a 1-3 to 0-0 lead and by half time they were 2-10 to 0-3 ahead. Clooney-Quin, beaten in two finals in recent years, were 2-9 to 1-3 ahead at half time in their clash with Sixmilebridge and they went on to win on a scoreline of 3-14 to 1-7. Inagh-Kilnamona and Truagh-Clonlara have only moved up to senior ranks in the past two years. they were level at 1-4 each at half time in their clash before the mid Clare side got the upperhand with Fiona Lafferty, Theresa O’Keeffe and Aoife Keane impressing as they went onto seal a 2-14 to 1-5 victory. the remaining first round game will take place at Kilkishen on this Saturday at noon when Kilmaley take on newly promoted Scariff-Ogonnelloe.